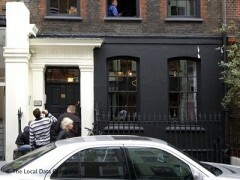 About: Located almost directly opposite the Groucho Club , Blacks opened in 1982. Between 1764 and 1767 this historic building was home to 'the Club' - a dining club founded by Samuel Johnson and Joshua Reynolds. "Sunday lunch has never been this indulgent"
Dionysus, the ultimate hedonist and god of wine in Greek mythology. During these wild events revellers gorged on food and wine, yet managed to remain nimble enough to participate in the orgies that ensued, until the events were finally banned in 186 BC. The five course Sunday lunch offering at Soho member’s club Blacks steers clear of orgiastic experiments, however it is indulgent enough for most bon vivants – there is no place for traditional roasts here. Blacks owner Giuseppe Mascoli (also responsible for the esteemed Franco Manca pizzerias) invites a different guest chef on each occasion to serve up a meal of their choosing, and where better than in this 18th century townhouse, where diners can clamber up creaking staircases to eat in front of grand fireplaces and amidst original works by Hogarth. Chef turned food critic Bill Knott, along with in-house chef Robin Freeman are responsible for today’s homage to 1970s dining. The event kicks off with canapés served on the ground floor, which include duck rillettes topped with a slither of candied orange peel, the extremely retro Lancashire cheese and pineapple on sticks, and gigantic, fleshy prawns the size of bananas with Marie Rose sauce. There is an animated chatter as the room becomes more and more cramped and guests wander over to the counter to purchase bottles of the recommended Bourgogne Aligote (each course is paired with a different rare wine, naturally) until it is time to venture upstairs for the main meal. Coquilles St-Jacques is the first course. The breadcrumb and potato layer covering the top breaks open to reveal a creamy fish pie with tender scallops and white wine, served on an entanglement of pretty seaweed. The main is the classic coq au vin, brought to the tables in large casserole dishes for diners to help themselves to. The chicken portions are cooked in Vin Jaune, which adds sweetness to the wrinkly morels and crunchy asparagus. Wide fettuce noodles cooked with butter and tarragon are the side dish. Next up is a refreshing sorbet with a hint of spice: the frozen melon and ginger is paired with some very salty, smoky Parma ham. As a palate cleanser we are served a whiff Camembert cheese covered in a floury, peppery crust which oozes out on to the wooden tray when sliced. For dessert, the final tribute to the 70s, a black forest gateau with luscious cherry, rich chocolate and cream. And the price for all this glorious food? A mere £35, not including wine. A friend who's a member thoughtfully introduced me to Blacks. It's a really lovely place to spend an evening in civilised company and enjoy some delightful food and wine.